It's time to start knowing what is going on in your online business. It's time for decisions to get easier. It's time to have one place from which you can explore the effect and impact of your website and other online properties. It's time for your own Conversion Optimization Lab. Here is a collection of resources that we believe you should consider adding to your online marketing toolkit. Start with the Spy Equipment It's fun to find out what your competitors are up to. Then move on to the Analytics section, the foundation for website insight. Then scroll through and see just how much you can know about your digital footprint. Your conversion lab will be the jumping off point for all of your online decisions. Here is the information you need to build a website that wins. Brought to you by Conversion Sciences, the Conversion Optimization Agency. If you don't already have an analytics package installed, chances are that Google Analytics is the right place for you to start. However, if you are a growing organization with millions of visitors per months and millions of dollars of revenue coming from your website, it is likely that you've outgrown google analytics and are ready to consider enterprise class packages like Site Catalyst or Coremetrics. Read below for a brief description and review of many of the most commonly used analytics packages on the market today. Speed counts in today's global marketplace. Google Tag Manager gives you the power to create and update tags for your website and mobile apps, any time you want, at the speed of your business. We create real-time web applications that are a pleasure to use. Web apps that enable you to learn who, why, how, where from, and for how long people visit your site. You don't run a website to spend hours analysing tables of traffic stats. IBM® Coremetrics® Web Analytics is the analytics center that fuels the IBM Coremetrics Digital Marketing Optimization Suite. Your enterprise can gain a competitive edge by benefitting not just from state-of-the-art analytics, but also from comparative benchmarks and knowledge of how the best performers are achieving their successes. 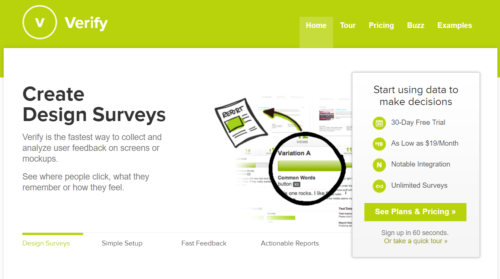 KISSmetrics provides simple yet powerful reporting based on your person-centric data. You’ll get actionable insights without having to use your own engineering cycles. Woopra gives you the tools to seamlessly make your analytics directly actionable by getting the right message to the right customer at the right time. Automatically personalize each customer’s experience with your site by showing highly targeted promotions and ads, customizing content, or making product suggestions. Unlike any other analytics service, Woopra doesn’t just help you make better decisions, it gives you the power to execute them. It's all the power and ease you expect from Google Analytics plus extras that help you optimize and get the most from its robust capabilities. All for one full predictable, flat-rate, everything-included annual fee. Awesome resources for those online marketers who know how to read. Is it possible that this book was written in 1923? Is it possible that a book written before the depression is the foundational work for those of us optimizing our online businesses? Yes, it is possible and true. 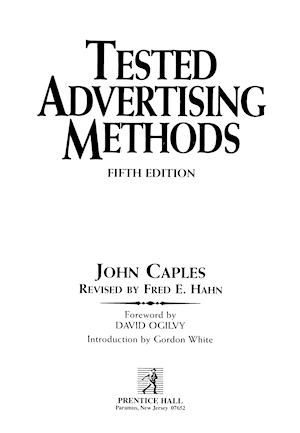 Before the Internet, there was Scientific Advertising by Claude Hopkins. It’s a brief, clear and even motivating read. 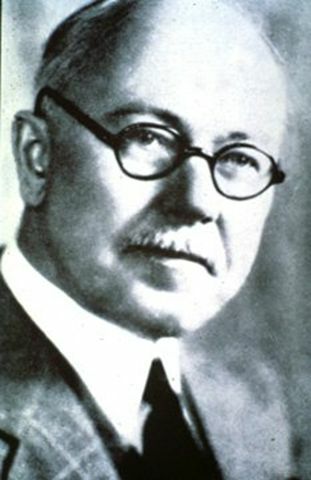 You will find Claude Hopkins Scientific Advertising free download in the Conversion Lab. Claude definitely earned his lab coat in our opinion. 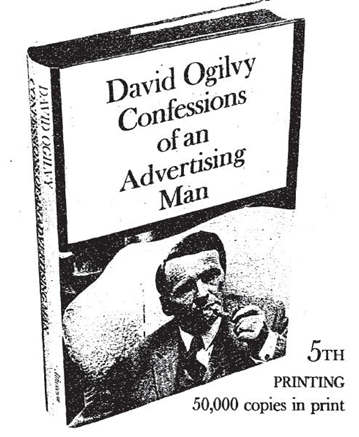 Also see Ogilvy on Advertising. Mongoose Metrics technology exposes what happens before, during and after phone conversations to provide clients with actionable data for effective marketing spending. By implementing Mongoose Metrics’ solutions, marketers will have a holistic view of their buying process and how phone conversion optimization drives sales performance. With Ifbyphone, you manage, measure, and automate voice interactions with your prospects, such as phone calls, creating closed-loop marketing where every lead is captured, responded to properly, scored, and then nurtured. In their own words: LogMyCalls is the smarter call for companies that demand more from their call tracking software. It's the one application that provides more insight, flexibility, and control for optimizing marketing and maximizing sales. In their own words: Increase targeted traffic, maximize website conversion rates, and improve sales team performance. 30 Billion inbound calls per year. Who's calling you? We love all of the tool categories on this page, but we especially love these. 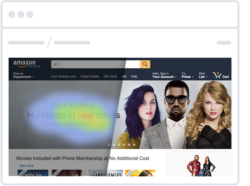 Basically, Click Tracking and Heatmap tools show us how users are interacting with our pages. They show us where we are getting real visitor's attention and where we aren't, where people actually click on the page, even if the element is not clickable and how people scroll through the content on our pages. Some of the tools even record visitor sessions so that we can see exactly how key user types interact with site thought their session. CrazyEgg offers tools to help you visually identify the most popular areas of a your page, help you to see which parts of your pages are working and which ones are not, and give you greater insight as to what your users are doing on your pages, both mobile and full sites. In their own words: Mouseflow lets you record website visitors and see website heatmaps showing where they click, scroll and even pay attention. All-in-one Analytics and Feedback – See how visitors are really using your website, collect feedback and turn more visitors into customers. Services include heat maps, feedback polls, surveys, conversion funnels, form analytics, visitor recordings, and recruiting user testers. In their own words: Understand how visitors see your website. Visualize clicks and mouse moves, discover which areas draw visitors’ attention and which go unnoticed. Test every part of your page and find room for improvement. A website tool that allows you to record users sessions, see problems, fix them, and turn visitors into paying customers. Session Records that include useful information such as: referrer, IP Address, Country name, language, Browser, Operating System, Device type, Screen resolution, Landing page and Exit page, among others! Bit.ly is the most popular URL shortener on the Web. It has been especially popular with Twitter, and is integrated with many other services. Furthermore, it tracks the links that others are sharing, so you can get a sense for how much others are sharing your links if they use Bit.ly, too. ClickTale captures every mouse move, click, scroll and keystroke that a visitor makes inside a webpage, and then sends this information back to the ClickTale servers in a highly compressed package. Our servers take a snapshot of the webpage as experienced by the visitor, and combine it with the visitor actions to recreate the original browsing session. When you then login to your ClickTale account you can see your visitor recordings, visual heatmaps and other behavioral reports. Capture is a secret business weapon. Now at your fingertips, you have the mobile and social engagement tools that empower your business to reach and connect with customers where they work, live and buy. You can now learn from and apply real-time data and analytics across all communications functions to improve multiple business performance goals. Over three years of evolution, analytics and insight have formed a suite of tools within one, simple solutions brings you power and control unlike many existing technologies. Quantcast Measurement provides free, directly measured traffic and audience composition reports. These reports are Media Ratings Council-accredited, ensuring that your traffic data is both accurate and reliable. Charge Your Marketing Batteries. Content is the key. It draws new leads to you and then draws them back into your sales funnel. Save time and extend your reach when doing content marketing. These are the browser plugins we use on a daily basis to rock the house of science like it ain't never been rocked before. These plugins range across categories, from analytics debugging to competitive intelligence. Google Analytics Debugger tracks page views, events, e-commerce transactions, custom variables, social interactions and AdWord campaigns, exposing data to developers and allowing them to debug Google Analytics tracking code live on their websites. Wondering what to test? Well, you have two options. Call us, or check out some of these to see what other companies who "GET IT" are doing to increase their conversion rate and revenue per visit metrics. A fantastic library of split and multivariate tests for you to peruse. Subscribe for a free weekly challenge by email. See how good you are at predicting results. These days, you can't throw a rock without hitting a dozen wordpress sites….you might even hit one of ours. We love wordpress for certain types of sites. But, some of the out-of-the-boxness that can make wordpress so useful also make it difficult to add conversion boosting functionality without ringing up your developer or designer and busting out the checkbook. These are the Wordpress plugins we use on our own sites and recommend to clients as well. These plugins won't solve all of your problems, but they'll keep you from banging your head against the lab wall for no good reason. The landing page has a singular purpose: To keep the promise you made to get the user to click through, and to entice them to take action. Several online services offer easy-to-create landing pages and integrate split testing into the mix. It's a key piece of equipment in the conversion lab. Premise empowers you to quickly and easily build custom, graphically-enhanced landing pages without cost, code, or hassle. LiveBall is software that converts more web visits into business. It helps marketers and agencies produce, target, test and optimize their most compelling web content — luring more fish into their nets. With a rich user interface and a complete set of features, Unbounce offers marketers a way to test a variety of landing pages without hassling with the IT department. Lander offers a simple way to create landing pages and split test them. People are free of their desks and interacting with your business from the most unexpected places. And they are using a wide variety of devices. These tools help you test and measure your most nomadic visitors. More on Mobile Testing. Appsee is a simple and powerful visual in-app analytics platform that enables you to measure, understand and improve the user experience in your mobile app. Attention tracking tools show us how the pages of our website are seen by our visitors. These tools range from eye-tracking simulations to tools that simply show how a page looks in different browser sizes. These tools help us determine how the visual hierarchy and design of any page is performing relative to how our users read the page and consume the information we are presenting. 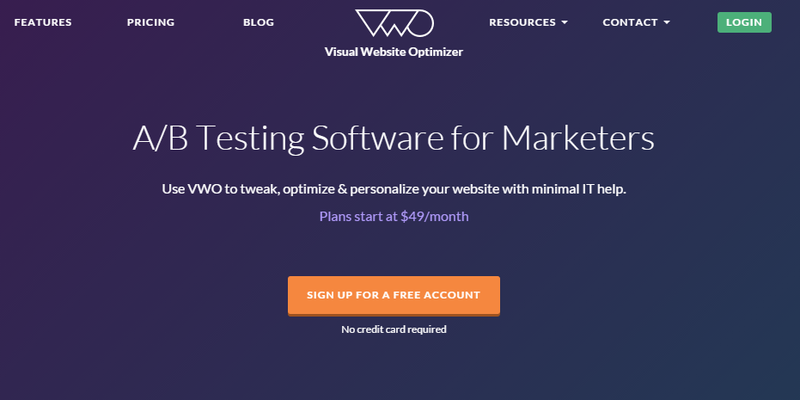 AttentionWizard is an affordable, revolutionary tool for website designers and marketers to validate web designs before they go live. Get valuable insights to optimize the branding, colors, images, layout and buttons on key landing pages, before presenting to your client or boss. We help companies design websites that stand the test of attention and help your users find what they are looking for immediately. EyeQuant-optimised websites evidently communicate benefits quicker, provide a much better user experience and yield significantly higher conversion rates. In their own words: Capture full web page screenshots in Firefox, Chrome, or IE, and then edit and save them. In a few clicks! Tools to ensure your site and tools are working as they should be. This is a browser plugin that lets you manage cookies. Great for clearing cookies while doing QA on test treatments. Using Baynote’s patented approach, retailers are able to understand buyer intent “in the moment” across the shopping experience to deliver compelling offers, content and product recommendations that increase engagement, conversion and average order value. RichRelevance helps retailers increase sales and customer engagement by recommending the most relevant products to consumers regardless of the channel they are shopping. The voice of the customer provides invaluable insight into how your brand is perceived. Bazaarvoice allows clients to leverage this voice by creating online social communities that encourage authentic conversations about your brand. You can then amplify these conversations across a global network, allowing you to connect directly with customers. We also provide the tools that allow you to translate this user-generated content into actionable insights that drive improvements in marketing, sales, customer service, and product development. These help build trust with your visitors. This is very important to online stores. The AllClear ID Alert Network is the first of its kind: our technology gives you the ability to respond faster alerts about your identity, and take action if you suspect fraud. Today we have several alerts for our customers including Fraud Detection, Credit Monitoring, and ChildScan. As we continue to build the network, we will have the ability to alert you quickly and in more places when your identity is at risk. Billions of consumers and businesses worldwide rely on Verisign every day for access to online commerce and communications. Our expertise allows us to deliver unmatched performance in DNS services, Internet infrastructure security, and much more. What is SEO Book? In Short? We offer the #1 SEO training program. And it comes with tools, videos, a private member's forum, and so much more. For the Online Store conversion formula, one of the key strategies is to keep buyers from checking out when they check out. The quality of your shopping cart is the key to this. These tools enhance or replace your shopping cart for higher conversion rates. SeeWhy creates a breakthrough in website conversion for many of the world’s largest and best known brands. 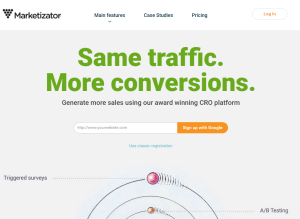 In their own words: ONE STOP SHOP FOR ECOMMERCE PERSONALIZATION Increase sales and conversion rates by utilizing our rich website personalization suite. 5 minute setup No coding, no backend integration, no risk! Just add a single code snippet and you're done. We do the rest. What if you could get a second chance when a shopper abandons your shopping cart? Rejoiner is that second chance. This online service brings cart abandonment emails to the masses with a reasonably priced service. Social media offers a way to save the attention of your visitors, like a battery saves electricity when it is charged. Use Content to discharge the battery and bring social friends, fans and followers back to your site for another chance to convert them. 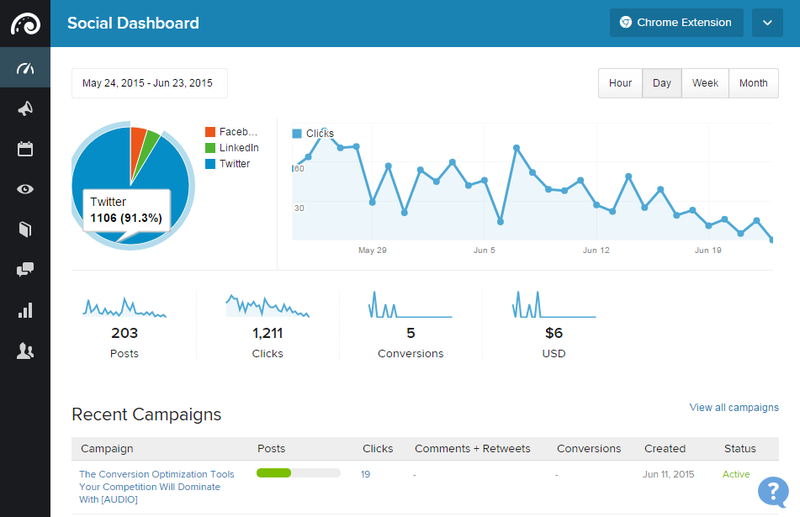 We like this social media management platform because it allows us to track conversions from social interactions. The reporting still needs work, though. Twitterfeed will take any RSS feed and automatically generate tweets from it. Spredfast provides an enterprise-class SMMS that major brands rely on to scale social across their organizations. We check all the boxes of what big brands need. What they say: Save your time and your sanity. Improve productivity by managing all of your social networks within HootSuite. The dashboard is designed for you and your team to listen, engage and measure all from one simple interface. Use these tools to see what your competition is up to. Are they using analytics? Are they testing? What keywords are they buying on search? You can't really log in to Ghostery. It's a browser extension that inspects the websites you're surfing. We like Ghostery because it tells you how sophisticated your competition is. It will tell you if they are using analytics, such as Google Analytics, Site Catalyst or Coremetrics. It will also tell you if they have installed testing software, such as Visual Website Optimizer or Test and Target. If you see a service on a site that you don't recognize, Ghostery will tell you quite a bit about it. Maybe your competitors know something you don't. Ghostery is your window into the invisible web – tags, web bugs, pixels and beacons that are included on web pages in order to get an idea of your online behavior. Ghostery tracks the trackers and gives you a roll-call of the ad networks, behavioral data providers, web publishers, and other companies interested in your activity. SpyFu is an online competitive intelligence application that allows you to browse competitors' PPC keywords, daily budget, bid prices, clicks/day, and other interesting PPC facts & figures. In their own word: BuiltWith is a web technology information provider, tracking over 150 million active websites and performing over 900 billion technology lookups each year, BuiltWith is the leader in the web technology research field. Strengths: SEMrush‘s data includes sites of all sizes, a list of key phrases and rankings for those terms — and provided the most accurate data of all the tools we examined. Weaknesses: The data were still imperfect. Customers must pay to get full data lists. And the data is only for Google traffic. Accuracy: The data were not perfectly accurate, though generally speaking SEMrush did not miss the mark for any of the sites we tested the way a number of the other tools did. In the end, the data were surprisingly accurate. As with some of the Google data, the information reported is just the Google search engine traffic, but this is our main area of focus and was quite accurate when drilling down into that specific area of traffic within analytics. How to best use SEMrush: Although imperfect, this tool came the closest to providing accurate data that I would, at least with a word of warning, be willing to share with a client about potential expectations or about where their competitors’ traffic may be. Most importantly, the add-on options and ability to see the keyword lists and how the competitor ranks for these terms is extraordinarily appealing. Huh? What does this have to do with conversion? Weeeeeell…..everything. As you'll often hear us say "The Money is in the List." Email is far and away the most efficient and effective channel for digital marketers, Plus, if you build a list and learn how to harness its massive cash generating power, that is something you will own forever and no increase in PPC rates or algorithm change that hurts your organic rankings can do a damn thing about it. We ONLY include tools on this list that have an autoresponder function. Use Content to discharge the subscriber battery and bring subscribers back to your site for another chance to convert them. Concepting tools help us translate our ideas and hypotheses into actionable instructions and specs for collaborators, designers and developers. These tools range from simple wireframe tools all the way to tools that allow you to build functioning mockups of complete sites. Mockups reproduces the experience of sketching interfaces on a whiteboard, but are easy to share, modify and get honest feedback. Wireframes made with mockups look like sketches so stakeholders don't get distracted by little details. WebSort enables you to conduct remote card sorting online. Create a study, send a link to participants, and analyze the results - all through a simple web-based interface. Take the guesswork out of information architecture with Treejack – the usability testing tool you can use to test your IA without visual distractions. Treejack helps you prove your site structure will work before you get into interface design. A card sort is a quick and easy way to find out how people think your content should be organised. It’s a useful approach for designing information architecture, workflows, menu structure or website navigation paths. Markup lets you draw on any webpage with a variety of tools to express your thoughts, make a point or just simply edit. Mockingbird is an online tool that makes it easy for you to create, link together, preview, and share mockups for your website or application. Testing your site is the only real way to know what your particular audience needs. There are many tools available at a variety of price points for you to choose from. More on AB Testing. As we've gotten to know the team at Convert.com, we/ve become fans. These guys offer a reliable, feature-rich split-testing platform that will compete with the best of them. In their words: A/B testing is one of the fastest methods to learn more about your visitors and their preferences. Our service is primarily used for conversion optimization onsite and in landing pages. Convert Experiment™ is used by many conversion experts by agencies, in-house talent, and consultants to support their testing and conversion needs. In their own words: Say goodbye to technical bottlenecks and hello to actionable data. When it's time to take action and make changes to your site, there is no replacement for dedicated technical resources — in most organizations, these resources are hard to come by and typically demand waiting in line. Optimizely acts as your on-demand technical team, with technology that turns your creative changes into instantly generated and deployed code. Has an API for those times when your test doesn't fit a typical pattern. We like Visual Website Optimizer because of its rich feature set. It enables the all-important ability to track e-commerce transactions so you can test Revenue per Visit (RPV) which keeps you from increasing conversion rates but decreasing the average purchase of buyers. Variant offers a novel approach to A/B testing, intended to overcome the limitations inherent in the existing service-based A/B tools. Their central argument is that at the enterprise scale, when it comes to online controlled experiments, all the advantages of the SaaS architecture become less relevant, while all the shortcomings mutate into fatal flaws. Instead, Variant offers an enterprise experiment server, running on the customer’s own network, local to the host application and to the operational data. All components of the host application (client, server, or anything in between) communicate with the experiment server via light-weight client libraries*, while the server-side API provides centralized core feature extensibility. Variant server also acts as a distributed session manager, enabling Variant’s critical features in a modern distributed environment. A single Variant server can support multiple application domains via experiment schemata. Each schema file, contains complete definitions of all experiments instrumented on a particular application. Even if you only have a single application, you will find the ability to deploy separate schema for every QA build very attractive. Direct and secure integration with operational data. Negligible system overhead due to experiments. Unparalleled ease of deployment and dev friendliness. * Variant is a recent startup: at the time of this writing they only support host applications with a Java back-end. Loop11 is a remote usability testing tool that enables you to test the user-experience of any website and identify navigaational and usability issues. Get the hard facts about your website quickly and cost effectively! Usabilla helps you to understand your customers attitude and their motivation to visit your website or use your services. UserTesting.com lets you “look over the shoulder” of people in your target audience while they use your website. And we make it fast, easy, and inexpensive, so you’re more likely to do it. UserVoice creates simple online feedback, help desk and knowledge base software. Our insight and support platforms enable businesses to understand and engage with customers with ease. Ethnio is a tool that you use to recruit participants for research from your web site live, instead of scheduling them in advance. Morae is a leading usability software that removes the guesswork from your decisions and helps you make products people love. Record user interactions, efficiently analyze results, and instantly share your findings with anyone, anywhere. 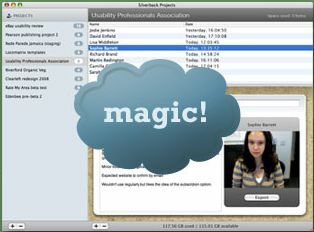 Silverback makes it easy, quick and cheap for everyone to perform guerrilla usability tests with no setup and no expense, using hardware already in your Mac. Kampyle, a pioneer in feedback analytics and customer feedback systems, helps businesses to excel in online lead generation, optimize lead capture landing pages, overcome shopping cart abandonment, etc. Similar to online questionnaires or online surveys, Kampyle's feedback forms enable you to listen to the voice of customer and to improve customer satisfaction. Kampyle offers feedback form software for small businesses as well as for enterprises, including enterprise feedback management. Identify new optimisations & returns. How to make video that converts. In their own words: Generate revenue with your video marketing by tracking individual viewer data with your marketing automation and CRM tools. Brightcove Professional Online Video Services offers start-to-finish consulting, strategy, design and development services to bring your vision to reality in the shortest time possible. Ooyala powers multi-device video for the world's biggest media companies and brands. iPerceptions' mission is to revolutionize web analytics by fully democratizing the voice of the online customer. In the web environment, people can speak for themselves, and iPerceptions ensures that they are heard at the highest decision making levels. KISSinsights gives your customers a way to tell you what they need. 4Q is a website survey tool which allows business owners to evaluate the online experience, measure customer satisfaction and quickly implement website improvements based on real visitor feedback. These tools were discontinued or are no longer recommended by Conversion Sciences.